We hear it all the time, I live in the perfect location, great school district but if only we could… Let’s see; renovate the kitchen and bathrooms, add a sunroom, finish the basement, build a swimming pool, put an office over the garage or even add a second floor to our house. You get the idea, it is nice to dream. But maybe these sorts of renovations aren’t just a dream. 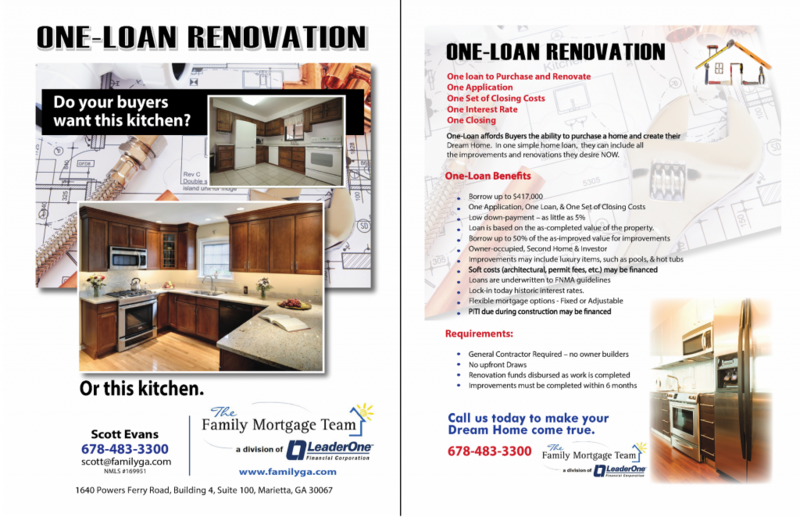 In One Simple Loan with The Family Mortgage Team in Atlanta, you can include all the improvements and renovations you desire now based on an appraisal that assumes that the work is already completed. In other words you can get a loan based on the equity that you create. And the sky is the limit on what you can do. If you’re ready to turn your home into your dream home, call us today at 678-483-3300 to discuss what options may be available for you!